Metal spinning is a well-known fabrication process that produces axially symmetric parts. This process is simple and yields high-quality results, and as such, it has become a primary production method for several manufacturers. Metal spun parts have proven to be essential to various industrial and commercial applications. A wide variety of shapes and geometries can be achieved using metal spinning. Hemispheres and Spheres are highly versatile shapes. Hemispheres are frequently used in the lighting industry as decorative fixtures and in the communications industry as satellite dishes. Hemispheres can be welded together to create spheres, which provide the strength needed for demanding geological applications. Cones are used in applications that include alternate energy support and soil and concrete testing; in fact, two cones can be welded or soldered together to create slump cone funnels, which are required for concrete testing in the U.S.
Manufacturers utilize metal spun cylinders for different types of custom piping, tubing, and other products. 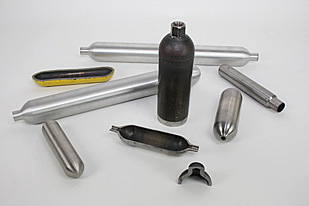 These seamless cylinders are created using processes such as rolling, bending, and forming; these pieces are commonly used to create pressure vessels capable of withstanding high pressures. Reentrant spun metal pieces are easily identified due to their narrow shape. Reentrant-shaped pieces are primarily used in the food industry—applications include housing for pressure cookers and smokers, different cooking kettles, and individual soup cans. Metal spinning the most cost effective forming solution for this shape. The parabolic shape is frequently used in the communications industry. This metal spun shape is extremely conducive for accurate signal transmissions; antenna reflectors and satellite dishes are prime examples of parabolic products. Venturi metal shapes closely resemble hourglasses. These shapes are highly versatile; venturi pieces are used for dust collection in the power and bulk solids industry and spray painting in the automotive industry. Different metal spun shapes are utilized throughout several industries, such as aerospace and defense, waste storage industry power, oil and agriculture, architecture, furniture manufacturing, HVAC, and many others. Due to the assortment of shapes produced through this process, metal spinning is highly valued in both commercial and industrial applications. Depending on the specific form and structure of a component, there can be more than one metal fabricating process that can be used to meet the same end. Although different processes can achieve similar results, there may be greater benefits of one over another. Metal spinning, a process that forms axially symmetrical parts, is a fairly simple process that produces advanced results. Metal spinning is not traditionally thought of as an advanced process, but technological innovations have enabled the production of components that require extremely tight tolerances. Combining the past with the present, metal spinning joins together the skills of the craftsmen with the automation of current machine technologies. Since this process forms a metal component on a lathe instead of stamping, cutting, or deep drawing, metal spinning calls upon the expertise of the machinist and the equipment to meet the required specifications. There are two types of metal spinning options available: CNC and hand spinning. Both processes form a metal disk over a block to produce conical, cylindrical, parabolic, toroidal, venturi, and hemispherical shaped pieces. Also, these processes offer unique benefits, and the combination of the two can create finished products of even higher quality. CNC spinning machinery enables high production capabilities and allows high strength materials to be formed accurately. It is a highly repeatable process that delivers precision results; automated and CNC spinning that is assisted with hydraulics replaces expensive tooling required for stamping and produces more cost-effective components. Hand spinning is suitable for smaller runs and all types of industrial and precious metals and alloys. Perfectly finished parts, without stretch marks or wrinkles, are consistently achieved. Hand spinning is ideal for prototyping, products of varying sizes, and architectural and decorative pieces. The inherent level of repeatability found in metal spinning enables the production of tight tolerance componentry. Due to this fact, metal spinning is just as effective as other fabricating processes. Metal Spinning (or spin forming) is a process where a tube or a disc of metal is rotated at high speed and transformed into an axially symmetrical object. Metal spinning is usually performed on a vertical or horizontal lathe using CNC controls or hand processing. So, by its very nature, metal spinning is an example of a technology that has spanned a timeframe stretching from the days of hand-tooled craftwork to the modern computer era. How do the two techniques compare, and how do they complement one another? Good questions. Let’s take a look. During hand spinning, the operator controls both the spinning speed and forming forces. Hand spinning is a craft where the operator subtly works with the material to create a form. This is done through precise motions rather than brute force. A form is created by an operator who can feel the structure of the metal, its grain, its hardness, and its willingness to move in one direction or another. With one hand, the operator uses the spoon to shape the work piece over the block, while the other hand applies the necessary lubricants or additional pressure to assist the process. There are an infinite number of tool designs that can be forged in steel to assist in spinning a variety of shapes. The products created by hand spinning cover a wide range: prototypes of beverage cans, mechanical parts for satellites and aircraft, components for semiconductor manufacturing equipment, large parabolic antennas, and so on—many products of all different sizes. The use of hand spinning has many manufacturing and economic benefits. There are several advantages of automatic spinning, as well. For example, it removes the many uncertainties of operator skill and operator-to-operator variations, making spinning highly repeatable and accurate. After a CNC machine has been programmed (or ‘trained’), it can automatically execute the instructions, hydraulically applying predetermined forces for predetermined lengths of time on precise areas of the blank, creating fairly identical parts. Such machines can automatically shape the part, trim or otherwise finish the edges, and eject the finished part. These programs can also be transferred from machine tool to machine tool, stored for future processing, and easily updated and refined for future runs. The use of highly skilled metal spinners is no longer necessary to run these machine tools. However, an operator must still be knowledgeable about the intricacies of metal spinning, as well as the control software required to run the part. An ideal machine shop has both – hand spinning as well as CNC spinning capabilities. Manufacturers choosing to work in metal spinning can tap into the high production capabilities of an automated shop floor, but they may also require manual spinning to create more intricate architectural and decorative products. Combining both of these techniques allows for the mass production of the bulk of a product line through CNC automation, while finishing it up with hand spinning, to create a product that is hand-crafted. Additionally, shorter run productions may be more cost-effective when completed with hand spinning, removing the time it takes to set up and program a CNC machine. 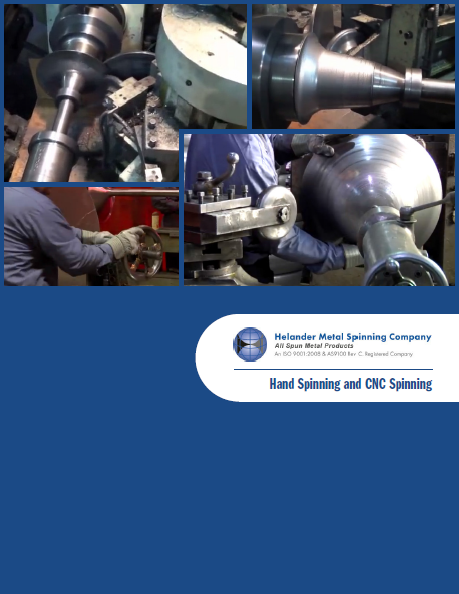 For more, check out our new, free, e-book "Hand Spinning and CNC Spinning." The American Society of Mechanical Engineers (ASME) first published the Boiler & Pressure Code (BPVC) in 1915 in response to the need for safety measures in the production and use of boilers and pressure vessels. In the early 1900s, boilers and pressure vessels – closed containers designed to hold gases or liquids at a pressure substantially different from the ambient pressure – were new innovations. These innovations promoted and advanced industrial activity in the U.S., specifically for companies that utilized machines for long-range transportation and heavy lifting. Safety, however, was an issue. Accidents and fatal disasters were caused by cheap production practices in the early 1900s, careless operations, and temperamental machinery. Because of these issues, the ASME’s BPVC was born and it has played a vital role in manufacturing and industry for almost a century. Pressure vessels come in all shapes and sizes, each of which can affect the strength and function of the vessel. Common pressure vessel shapes include sections of spheres, cylinders, and cones, with the most common design being a cylinder with end caps called “heads.” The heads of most pressure vessels are often shaped liked dishes, a round/circular design. According to the previously cited ASME article, “More complicated shapes have been more difficult to analyze for safe operation and are usually far more difficult to construct.” Shape can also affect the strength of a pressure vessel, with spherical pressure vessels having twice the strength of cylindrical pressure vessels. While the shape of a pressure vessel may present production and safety challenges for some manufacturers, that’s not the case for Helander Metal Spinning Company. 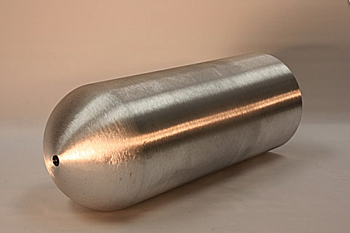 Helander manufactures pressure vessels of varying shapes and sizes, fabricating seamless custom pressure vessel shells through a special hot spinning process that creates vessels made from stainless steel, mild steel, or aluminum. The pressure vessels can be manufactured with or without bottlenecks depending on a customer’s specifications, and all pressure vessels manufactured by Helander meet ASME safety standards. For more information about custom pressure vessels, specifications, and manufacturing capabilities, visit Helander’s website. At Helander Metal Spinning, we take pride in what we do. We constantly strive to meet and exceed industry-accepted standards of quality for our metal components, including those for the aerospace and defense industries. As a result, we were recently certified with AS9100 Revision C certification. The AS9100 certification is a widely accepted aerospace quality standard that made improvements upon an earlier standard, AS9000. 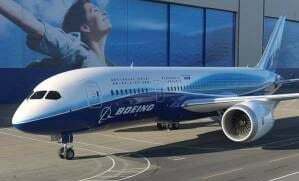 Released in 1999 and most recently revised in 2009, AS9100 is now a requirement to do business with a number of major aerospace manufacturers and suppliers all around the world. The certification is essentially a sign of support from the industry’s leading members. To obtain AS9100 certification, an organization must implement a quality management system that has a proven ability to produce high-quality parts consistently. The system must also incorporate a procedure that facilitates ongoing progress and improvement, and meet customer expectations while meeting all statutory and regulatory requirements. Helander’s aerospace metal components are typically made from titanium, 321 stainless steel, and 7075, 5052, and 6061 aluminum with thicknesses between 0.018” and 0.500”. We offer hydroforming, metal spinning and welding services within a delivery timeframe of 4 to 8 weeks. To learn more about our capabilities or speak to one of our engineers, please visit our website today. Metal Spinning is a process by which a disc or tube of ductile metal is rotated on a spindle and formed into an axially symmetric part. Through the use of heavy forces and high speeds, the metal will deform and “flow” to form the desired shape around a mandrel, a kind of mold that is shaped to the interior geometry of the planned part. This process allows metal to deform evenly, without any wrinkling or warping, to create a smooth, even, and seamless surface. The processes’ heavy forces also realign and strengthen the grain structure, significantly increasing the tensile properties and fatigue resistance of the base material. Metal Spinning offers a series of compelling benefits for prototype and specialty work. High precision tolerances are easily attained on a wide variety of metal materials and designs. Mandrels are easily manufactured using traditional lathe and mill work, and considering that they are not subjected to excessive force in normal use, may be made of nonmetal materials. CNC control, hydraulic assistance, heat for hot working, and toolholders can all be incorporated into the metal spinning process. Overall, Metal Spinning permits an unparalleled level of flexibility, speed, and efficiency without sacrificing the precision and accuracy delivered by traditional processes. For designs that are not conducive to spinning operations, Metal Hydroforming provides similar benefits and efficiency gains, effectively replacing work performed by machining or dies. The sheet hydroforming technique replaces one of the rigid dies used in conventional stamping with highly pressurized hydraulic fluid, contained by a urethane diaphragm, to force the sheet metal into a one-sided die cavity. Since the diaphragm, which is essentially acting as the female die, has no distinct shape, its dynamics allow it to take on the shape of any conceivable geometry. Complicated shapes with concavities are now possible in a single press cycle, reducing the amount of follow-up work and required forming operations. Produced to net shape, a single hydroformed component can often replace multiple parts, resulting in assemblies with fewer parts, higher strength, and less cost. Metal Hydroforming brings many advantages over the typical die press processes that it replaces, especially in the context of prototype and specialty work. New part designs only require replacement of the lower die, which is usually made of cheaper cast iron and not expensive tool steel. During pressure application, friction and stress on the sheetmetal is significantly diminished, resulting in more consistent stressing and increased material drawability. Supplemental finishing operations are not necessary as the material is not marred as it is in standard die operations. Simplicity, efficiency, and service life are all upgraded significantly with Metal Hydroforming. With the combination of these two processes, a new, and far better, system for prototype and specialty work is realized. Metal Spinning and Metal Hydroforming provide a definite pathway for one-off productions, design formulation, scratchwork, and design qualification, and simultaneously provide a full replacement for expensive, time-consuming traditional methods. Furthermore, both processes may work with just about any cold formed metal, and are easily reconfigured for high production work without any sacrifice in quality. Once the prototype becomes the new product, Metal Spinning and Metal Hydroforming are flexible enough to become the manufacturing system for it. Helander Metal Spinning is an experienced provider of those two services, able to add Metal Spinning and Metal Hydroforming capability to your production paradigm. Helander’s engineers, manufacturing technologists, and material specialists can provide in-depth analysis of component design, advise you on the feasibility and practicality of using metal spinning or hydroforming to form your component part, and can completely manage the production thereof within their state-of-the-art manufacturing facility. Contact us today to let us help you decide what’s best for your bottom line. Download our latest eBook Metal Spinning and Hydroforming - The Stamping Alternative. 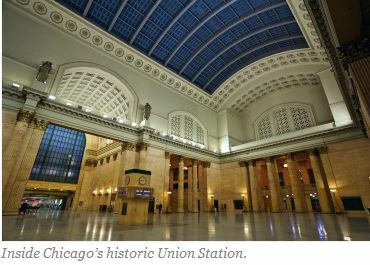 Chicago’s Union Station has been a Windy City landmark since 1925. Located just outside of the famed Chicago Loop, it takes up almost 9 ½ city blocks and is the hub of all train travel in and out of the city. Recently, we were approached with the unique opportunity to work on a very interesting project for the station. The owners decided that in order to increase security at the station, it would be a good idea to install concrete barriers to keep trucks from coming too close to the building. Instead of just slapping up those ugly Jersey barriers that you’ve probably seen around, officials came up with the idea to adorn them with light towers that would be both decorative and secure. To do so, they hired us to manufacture custom steel lighting covers to top these safety/light towers, making them blend in with the overall neoclassical style of the station, which in turn will please both commuters and officials. Using our advanced custom metal spinning, Helander was able create the perfect light covers for each tower and because we used high quality steel, the covers will resist rusting and last for a long time to come. Starting this month, if you live in the Chicago area or will be passing through the station, you can check them out for yourself.